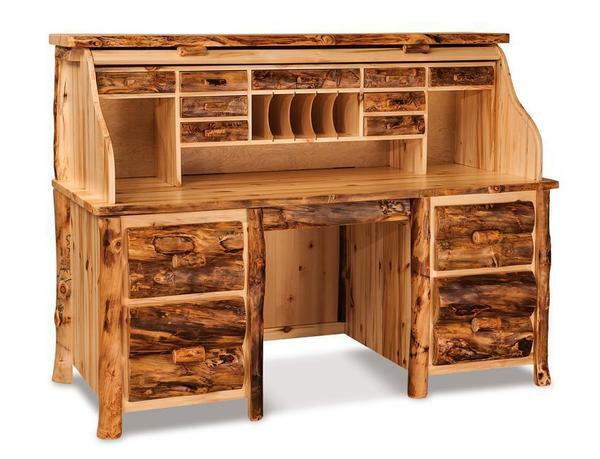 Our Amish Handcrafted Rustic Aspen Roll Top Desk is a one of a kind desk that will bring the beauty of nature to your office. The rustic aspen wood used to handcraft this roll top desk is a durable and popular wood for log furniture builders and one that shows very unique characteristics making each desk a one-of-a-kind piece. This desk is 100% American made by our talented Amish wood workers that are dedicated to building every piece of furniture with top quality, durable, and detailed craftsmanship. A few of the premium features that come standard with this desk include sturdy dovetail drawer construction, installed on full extension drawer slides, a pull out keyboard tray, four roomy file drawers on either side of the knee hole, numerous cubby drawers & letter holders, and a smooth gliding solid wood tambour that rolls shut to conceal the top section of the desk. The top quality Amish carpentry is evident in every detail of this beautiful roll top desk making it the center piece to any location with the durability to be enjoyed for generations. Contact one of our friendly Amish furniture consultants for additional information or custom ordering assistance. Our Amish craftsmen are always up for a challenge and willing to customize your desk to meet your specific design and style requirements.